Philip graduated with honours from UQ in 2016 and joined the NWPK team shortly after. 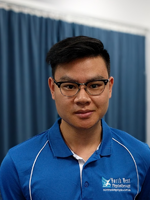 Philip is a qualified western acupunture/dry needling practitioner and has developed a keen interest in treating acute and chronic neck pain, headaches and TMJ (jaw) related issues. Philip is available for appointments from Monday to Saturday. Outside of work Philip enjoys catching the latest films and is a black belt in Karate.